Venezuelan opposition leader Juan Guaido declared himself the nation’s interim president on Wednesdsay as thousands of demonstrators cheered in support. Venezuela's crisis quickly escalated Wednesday as an opposition leader backed by the Trump administration declared himself interim president in a direct challenge to embattled socialist Nicolas Maduro, who retaliated by breaking off relations with the United States, his biggest trade partner. For the past two weeks, ever since Maduro took the presidential oath for a second six-year term in the face of widespread international condemnation, the newly invigorated opposition had been preparing for nationwide demonstrations Wednesday coinciding with the anniversary marking the end of Venezuela's last military dictatorship in 1958. While Maduro has shown no signs of leaving, his main rival, National Assembly President Juan Guaido, upped the ante by declaring himself interim president before masses of anti-government demonstrators — the only way, he said, to rescue Venezuela from "dictatorship." Outside the capital, seven demonstrators were killed amid disturbances during protests that rocked several cities. 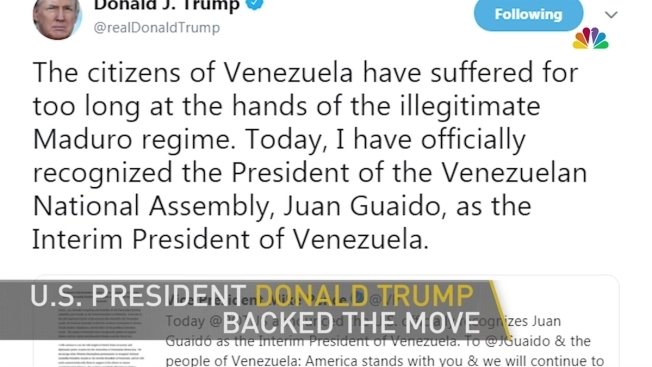 In a seemingly coordinated action, the U.S. led a chorus of Western hemisphere nations, including Canada, Brazil, Argentina and Colombia, that immediately recognized Guaido, with President Donald Trump calling on Maduro to resign and promising to use the "full weight" of the U.S. economic and diplomatic power to push for the restoration of Venezuela's democracy. "The people of Venezuela have courageously spoken out against Maduro and his regime and demanded freedom and the rule of law," Trump said in a statement. Florida Sen. Rick Scott called for designating Venezuela a "terrorist state" and imposing additional sanctions in order to pressure President Nicolas Maduro to resign. The stunning move, which to some harkened back to dark episodes of heavy-handed U.S. interventions in Latin America during the Cold War, drew a strong rebuke from Maduro. He responded by swiftly cutting off diplomatic relations with the United States, the biggest importer of the OPEC nation's oil, giving American diplomats 72 hours to leave the country. "Before the people and nations of the world, and as constitutional president. .... I've decided to break diplomatic and political relations with the imperialist U.S. government," Maduro thundered while holding up a decree banning the diplomats before a crowd of red-shirted supporters gathered at the presidential palace. "Don't trust the gringos," he said, rattling off a long list of U.S.-backed military coups — Guatemala, Chile, Brazil — in decades past. "They don't have friends or loyalties. They only have interests, guts and the ambition to take Venezuela's oil, gas and gold." Not to be undone, Guaido issued his own statement, urging foreign embassies to disavow Maduro's orders and keep their diplomats in the country. The 35-year-old Guaido, a virtually unknown lawmaker at the start of the year, has reignited the hopes of Venezuela's often beleaguered opposition by taking a rebellious tack amid a crushing economic crisis that has forced millions to flee or go hungry. "Today, January 23, 2019, I swear to formally assume the powers of the national executive as president in charge of Venezuela," he told the cheering crowd as he stood behind a lectern emblazoned with Venezuela's national coat of arms. "We know that this will have consequences," he shouted, moments before quickly slipping away to an unknown location amid speculation he would soon be arrested. Protests in solidarity with the nation's re-invigorated opposition movement took place in cities around the world. In the United States alone, demonstrators gathered in visible locations in dozens of cities that ranged from smaller communities like Ocala, Florida, to large metropolitan centers that include Los Angeles and New York City. 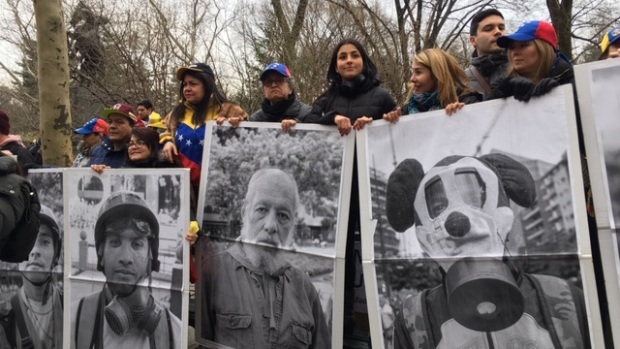 Protesters gathered at Central Park South show photos of victims and heroes of the protests of 2014 and 2017. Under the Simon Bolivar statue on the southern end of Central Park, Venezuelan residents of New York celebrated with hugs and tears of joy news that Guaido declared himself interim president of Venezuela. Cheers included “Venezuela, we want liberty” and “Out Maduro.” Others posed with photographs of what they said were victims of Maduro's government. “The proclamation of Juan Guaido is our hope, the answer to our fight. I’m excited, I’m happy, because I know this is the road to freedom for Venezuela,” said Gloria Requena, one of the organizers of the New York demonstration. Venezuelans also held rallies across Spain against the government of Maduro and in support of Guaido. Organizers said that around 7,000 protesters gathered in a central square of the Spanish capital, where there is a large Venezuelan community. The protesters cheered when exiled members of the Venezuelan opposition announced that the U.S. government had recognized Guaido's leadership. They called on Spain's Socialist Prime Minister Pedro Sanchez to follow the administration of Trump in endorsing Guaido. The more than 40 countries where protests were taking place Wednesday are home to about 3 million Venezuelans who have fled the country since Hugo Chavez came to power in 1998 and began to put in place what he envisioned as 21st Century Socialism. Early emigrants left for fear of increasing authoritarianism and violence in the country. In recent years, the flow of emigrants has grown exponentially due to political persecution and increased economic distress. Living in Venezuela has become increasingly difficult for all but the very rich. Wages are not enough to buy food, medicines are hard to find and essential services, such as electricity and water, are failing on a daily basis. The inflation rate in 2018 was a staggering 1,000,000 percent, and it has not dropped in 2019. The population living in Venezuela is increasingly dependent on remittances from family members living abroad to make ends meet. Among Venezuelans living both in the country and abroad, the dispersion of families resulting from the diaspora has provoked anger. A visible portion of the elderly population has been left in Venezuela. And young people are fleeing the country as soon as they finish high school or college. The events on Wednesday followed a whirlwind week that saw an uprising by a tiny military unit put down by government forces, fires set during protests in poor neighborhoods and the brief detention by security forces of Guaido. Guaido, who took the reins of leadership in the opposition-controlled Congress from a long list of better-known predecessors who have been exiled, outlawed or jailed, was dragged from an SUV just over a week ago by intelligence agents but was quickly released amid an international outcry. Over the last two nights, Venezuelans angry over their country's spiraling hyperinflation, and food and medical shortages have gathered in the streets banging pots and pans and setting up barricades in protest. In the city of San Felix, residents set fire to a statue of Chavez, Maduro's mentor and predecessor. In the run-up to Wednesday's protests, Guaido crisscrossed Caracas and other cities in central Venezuela attending outdoor assemblies known as "open cabildos" — for the revolutionary citizen councils held against Spanish colonial rule — pumping up crowds by arguing that Maduro must go for democracy to be restored. Other congressmen and women led cabildos in every town and city in the country. "I am absolutely certain that right now, especially younger troops are asking themselves whether Maduro is their commander in chief or a usurper," Alcala said. NBC's Jo Bruni and The Associated Press' Joshua Goodman, Fabiola Sanchez and Christine Armario contributed to this story.